In 1990-1991, as the Cold War was ending, the navy played a central role in Canada's involvement in the United States-led international coalition that ousted Iraqi forces under Saddam Hussein from Kuwait. 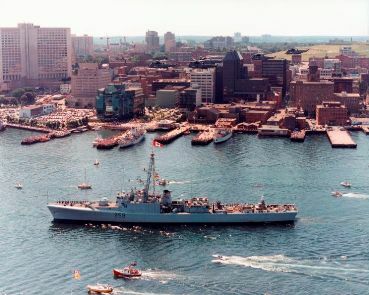 HMCS Terra Nova, part of Canada's initial response to the Iraqi invasion of Kuwait, leaves Halifax in late August 1990. The federal government ordered Terra Nova and the destroyer HMCS Athabaskan, along with the supply ship HMCS Protecteur, to the Persian Gulf to join the multinational coalition enforcing economic sanctions against Iraq. As the mission changed from the defence of Saudi Arabia and the implementation of sanctions to the use of force to oust Iraqi forces from Kuwait, the Canadian task force coordinated logistics to keep the massive naval operations in the Gulf supplied with food, water, ammunition, and fuel.